Now that Iowa Representative Steve King has safely delivered his seat to the Republican party, the party is returning the favor by throwing him under the bus. Not that King doesn’t deserve it. In a recent interview in The New York Times, King complained that racism was getting a bad rap. In response to a growing chorus of outrage, Republicans stripped King of his committee assignments. He was formally condemned by the House, and leading Republicans, including Sen. Mitch McConnell, Rep. Liz Cheney and Sen. Mitt Romney all called on King to leave office. LGBTQ people haven’t been immune to King’s attacks. As a state legislator, he warned that legalizing marriage equality in the state would lead to Iowa becoming “a gay marriage mecca.” Right up to last year’s election, King was dabbling in homophobic comments, implying that Supreme Court Justices Elena Kagan and Sonia Sotomayor were lesbians. 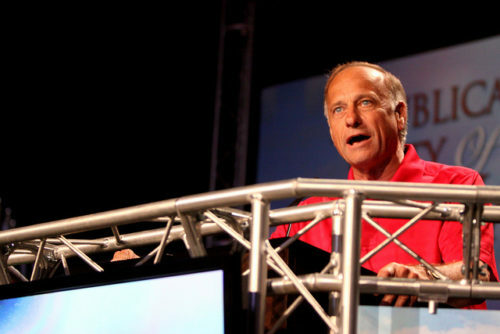 King has been a dependable, knuckle-dragging right-winger for 16 years in Congress, and for six years before that as an Iowa state representative. Nothing he told the Times was any different than anything he’d said in the past. Ironically, King’s question to the Times—how did that language become offensive?—is the very one that the GOP is facing. After years of just shrugging King off, the party has now decided that he’s a liability. That decision was probably helped by King’s close showing last November in a district that should be a slam dunk for Republicans. And by the fact that a state party regular is ready to run for King’s seat. In ridding itself of King, the GOP may be fooling itself into thinking it’s put the problem behind it. However, the Times story that triggered the whole controversy was a look at how King shaped the same messages now being spouted by Donald Trump–you know, the head of the Republican party. Party leaders are invariably invertebrates whenever confronted by Trump’s own racist comments, like describing white supremacist marchers in Charlottesville as “fine people.” King is a symptom of a racist rot that riddles the GOP, which is dependent upon racial resentment to animate its base. King is not a one-off. He’s at the far end of the spectrum, but he has plenty of company there, starting with the man at the top. Banishing King won’t absolve the Republicans of a problem that they have been happy to live with for years. Indeed, until they keep losing elections, they won’t view it as a problem at all.